You know how the French keep inventing new Festival of this and Foire de that kind of things? Well, apparently there’s a week called “Tous au Restaurant“, from 17 to 23 September, which is supposed to get us all rushing off to eat in a local restaurant. Isn’t that what they should be doing every week? It falls to Frogsiders, therefore, to explain, before you get too bored with wading through the French text, that this is a BOGOF offer in a number (unfortunately a small number in our region) of restaurants throughout France. A special menu is offered at the participating restaurants, on the basis that the second diner eats free. You can find out which restaurants are taking part in the offer, and reserve your table, by searching on the Tous au Restaurant website. It doesn’t necessarily tell you the price of the menu, though, or what’s on it, so you might have to phone the restaurant if you want to know more. 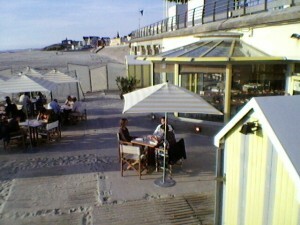 We found one restaurant, in Le Touquet, where the price was given as 25 euros, Monday-Friday only. 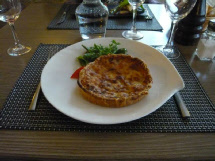 Don’t get too excited – there are two restaurants in Le Touquet, three around Boulogne, one in Calais, one near Ardres , and three in the Bethune area. That’s about it for the Nord/Pas De Calais. Editor’s Note: Since writing the above final paragraph, we have found out there are, in fact, several dozen Nord/Pas De Calais restaurants taking part in the Tous au Restaurant promotion. Here is a link to the complete alphabetical list of participating establishments. We are pleased to re-publish a piece including a restaurant review which appeared recently in “Sand-Blog”, an occasional journal written by Frogsiders publisher and local gite owner, Patrick Hay. stretches back 12 months, we took part of the day off to put ourselves in the place of our Sandboys holiday clients, and go and do something “touristy” in the region. This time we drove a few miles along the coast to have a look at Etaples and, in particular, the Museum of the Fishing Industry, « Maréis », which we had heard was well-presented and very interesting. 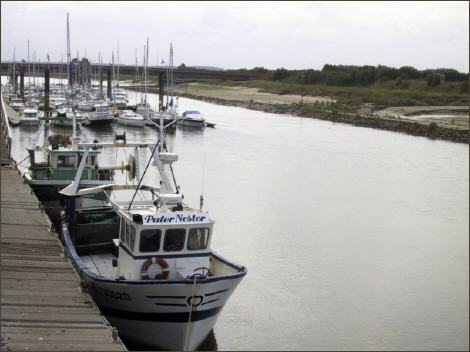 Etaples used to be one of France’s biggest fishing ports in terms of the tonnage of fish landed, but over the last 50 years, the estuary of the River Canche has silted up to the point where today’s larger fishing vessels are unable to use the harbour. The fishermen of Etaples, however, unwilling to lose the town’s major industry, have simply moved their boats a few miles up the coast to the port of Boulogne. The fishermens’ cooperative of Etaples numbers some 50 boats in its fleet. Most of them sail at the beginning of each week and remain at sea until Thursday or Friday when they return with their catch, a proportion of which is retained by the cooperative for sale in their own fresh fish shops and restaurants in Boulogne and Etaples. Some of the boats keep back a little of the catch to be sold direct to the public from the stalls on the fishmarket quay at Etaples. Each stall is decorated with paintings and the colours of the boat to which it belongs. Altogether, in supplying, manning, and maintaining the fleet, marketing, processing, transporting, selling, cooking and serving the fish, the cooperative provides work for thousands of people in Etaples and Boulogne. At Maréis you can see how the different types of fishing nets work and the variety of fish that are caught in the Channel waters between France and the south coast of England. There are aquaria where you can see the fish up very close, and rock pools where crabs crawl among mussels, starfish, oysters, scallops, shrimps and other seashore creatures. You can stand on the bridge of a modern fishing boat with its radar screens and depth sounders demonstrating the complicated world of the fishing boat skipper. There are guided tours and demonstrations, and films showing life on the boats are screened. Finally there’s a tank where you can gently stroke rays, as they swim playfully around from one hand to the next. We enjoyed our visit, and left via the shop where we found some nice books, games and souvenirs including a soft toy in the shape of a ray. a result of one of the best meals we’ve eaten in France for many years, we can thoroughly recommend L’Atelier 26, in rue d’Hérambaut. It looks like an ordinary bar or cafe from the outside. Inside it is furnished sparsely and simply, but it is warm and there is a friendly welcome, and above all, the food is top quality at reasonable prices. 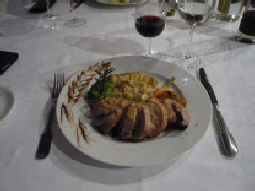 After a delightful complimentary appetiser and excellent seafood starters, our main courses were Haddock with a Smoked Herring sauce, and Roast Breast of Duck with a Cocoa Bean and Hot Pepper sauce. Both were superbly cooked, beautifully balanced for flavour, and nicely presented. The “moelleux au chocolat chaud coeur coulant caramel”, Chocolate “Moelleux” dessert with a fondant centre, was superior to anything we’ve had in top London and Paris restaurants. Normally a 3 course meal of this quality would cost almost double the 65 euros we paid for two, including wine and aperitifs. Restaurants come and go in terms of quality and value for money. 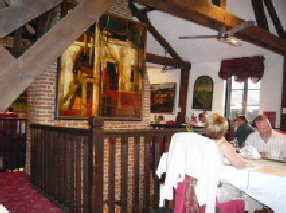 And one such Restaurant that has had a rather chequered history in recent years is ‘La Garenne’ in Huby St Leu, just outside Hesdin. until a couple of years ago when the food went off and the prices went up. kitchen as prepared food was heated up and then served! included – again seasonal – Brussels sprouts – and rosti potatoes, which complemented the venison, which was very flavoursome and tender, very well indeed! For dessert, we chose one of their famous – and quite generous! – coupes: for me, a coupe garenne with rum and raison ice cream; and for my wife, a fruit berry coupe. We chose, from their excellent and renowned – but quite pricy – wine list a 2003 Chateau-bottled Fronsac, which was served at room temperature – and, I would add, in the proper bordelais glasses! – and went down very well indeed. Incidentally, they operate a loyalty card system and on your fifth visit to the restaurant you are entitled to a bottle of their finest Champagne gratis! As usual, we had a table by the fireplace, on which, incidentally, they cook some of their meat dishes. ‘La Garenne’ – as Jaimie Oliver might say – is a funky place, both outside and in, and lives up to its name – the warren! It was decorated for Halloween. Indeed, on the way in through the garden one was met by life-size skeletons and wild beasts! They are also well known for their Christmas decorations, albeit, for some people, somewhat ‘ott’! The bill came to €67 and, quite full and satisfied, we paid and staggered from our table and, on leaving the restaurant, we went for a post-prandial – and much needed – walk around the block! We will certainly be back – if only to claim the free bottle of Champagne! 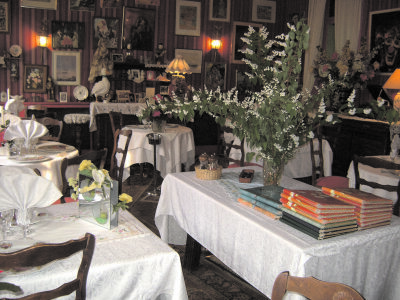 We are pleased to re-publish a restaurant review which appeared recently in “Sand-Blog”, an occasional journal written by Frogsiders publisher and local gite owner, Patrick Hay. “The other night we were planning to eat out before going to the cinema in Montreuil. The film (The Company Men, with Ben Affleck and Tommy Lee Jones, in English with French sub-titles) was not scheduled to start until 9pm, so we had plenty of time to enjoy a leisurely meal beforehand. We had aseafood place in mind, too – somewhere we hadn’t been before – the Brasserie “Les Pieds dans l’Eau”, aptly named as it is on the beach at the seaside resort of Berck (about 12 miles drive from Fort Mahon). This is the restaurant at Berck’s Agora Leisure Centre which I had noticed while attending swimming club training sessions in the excellent pool there. Seafood specialities and wines by the glass. 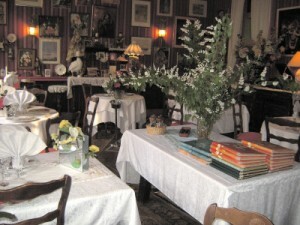 The restaurant is very comfortably furnished and nicely decorated in a modern style. It is accessed either through the basement level of the Leisure Centre (the restaurant is actually underneath the seaside promenade) or by steps down to the beach from the promenade. 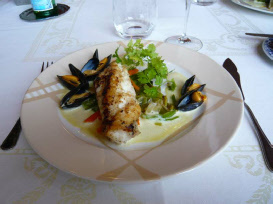 Appropriately for a seaside restaurant, the kitchen at Les Pieds dans l’Eau leans towards seafood, though salad and meat eaters are certainly not forgotten and will find plenty of choices on the extensive menu. There are some spectacular-sounding specialities as well as a sensible children’s menu. You’ll find almost all seaside restaurants in France are well prepared for families with small children – we noticed that Les Pieds dans l’Eau had a good supply of high-chairs available to cope with the summertime family seaside holiday rush. There is an excellent choice of wines, including a range of wines you can order by the glass. Unusually you don’t pay any extra for the “by the glass” option. A 12.5 centilitre glass is priced at one-sixth of the bottle price. We chose a very acceptable French Chardonnay from the Pays d’Oc, and since we had 3 glasses between us (only one for me, the driver), we paid for exactly half a bottle. We had to leave it there without trying any of the interesting range of desserts so that we could make it to the cinema in time, but we’ll be back on another occasion to see what they’re like. If you are looking to escape to a delightful place for a weekend, I can certainly recommend the Chateau du Landel, which is a three star hotel and restaurant in the heart of the Normandy countryside, just a couple of hours’ drive from our region. Situated in the Lyons’ forest, just outside the delightful village of Bezancourt, this eighteenth century chateau at one time was a staging post on the pilgrim’s route to Santiago da Compostella in North Western Spain. Until 1870, the chateau was owned by the Master Glassblowers (Maître Verriers), and since then has been in private hands. In fact, it is the family home of the Cardon’s and the hotel and restaurant are run by Monsieur Yves Cardon and his wife, Annick, who gave us a warm and friendly welcome on our arrival. We had a small but very nice room on the second floor, complete with exposed beams, overlooking the parkland at the back of the chateau, and we were struck by the peace and tranquillity of the place. It is, in fact, a ‘Relais du Silence’. In the grounds, there is a very nice swimming pool, complete with showers and changing rooms and also a tennis court for the use of guests. In a vaulted cellar in the chateau, there is a billiards room, and the chateau also boats a large seminar room for private meetings. The public rooms of the chateau are furnished with period furniture, and the beamed restaurant has a large fireplace. In fact, we had a table near the fireplace, which was lit and added a certain warmth and ambiance to the dining room. 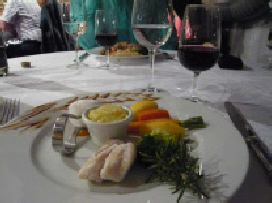 We enjoyed a refined three-course dinner, based on local fresh produce, which was well cooked and presented, and the service was attentive and friendly. The wine list was small, with a representative selection of French regional wines of good vintages, but quite pricey. Unfortunately, there was a distinct lack of half bottles on offer, which rather spiked our guns. Next morning, a delightful continental buffet breakfast was served in a small dining room, overlooking the garden, accompanied by bird song, including the cuckoo – a sure sign that Spring had sprung and Summer was on the way! There are some delightful country walks and bike rides to be enjoyed, as well as golf and horse riding on offer nearby. In fact, mountain bikes can be hired from the chateau. The historic city of Rouen is about twenty miles away, with its fine cathedral and other places of interest to visit. WiFi Internet access is available gratis in each of the bedrooms, which also have satellite TV, including BBC World, and, although we no longer have a dog, we noticed that dogs are welcome at the chateau. 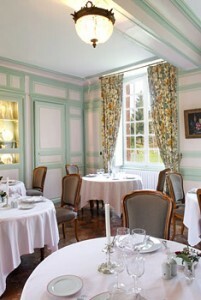 The chateau has 17 bedrooms, which range in price from 98 – 205€; dinner costs between 31.50 and 50€; and breakfast is €12. 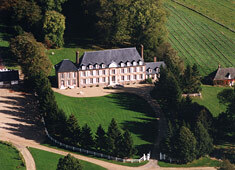 More information is available from the chateau’s website at www.chateau-du-landel.fr. Cod is “off” at La Matelote! 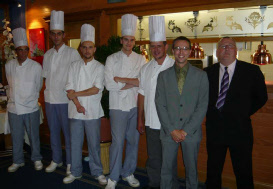 This fine restaurant, run by chef/patron,Tony Lestienne, celebrated its thirtieth birthday in 2009. Its distinctive antique furniture, paintings and eclectic artefacts combine with creative cooking and the fine – but rather pricy – wine selection to ensure a memorable visit – and a Michelin star. La Matelote takes its name from a famous local fish wife who sold fish from the quayside in Boulogne. A portrait of her is on display in the main dining room. Apart from the a la carte menu, the restaurant offers three formule (set) menus, including an eight-course menu degustation, which shows off Tony Lestienne’s ‘signature’ dishes of warm lobster salad, monkfish with parmesan gratin and raspberry millefeuille. On our recent visit, we opted for the great value €31 menu, recently reduced from €35 to reflect the change in TVA charged for restaurant food. So, what did we have to eat? Between us we had a long-time favourite, fish soup and a delightful salmon starter billed as le fondant de saumon mi-cuit a l’aneth. This lived up to its exotic name and expectation. Fish featured again in the main course – after all, this is a restaurant by the sea in Boulogne, reputedly the premier fishing port in France. The whiting (filets de merlan) didn’t disappoint and I was equally pleased with my veal served with courgettes aux sesames. One variety of fish you won’t find on the menu at La Matelote is cod. Chef Tony told Frogsiders he won’t serve it any more as he believes the species has become threatened through overfishing. He has tried to convince other restaurateurs in the area, but in vain, so for the moment he leads the way as the only chef to have taken this conservational stand. “I serve a lot of rouget, now,” says Chef Tony,” it’s an excellent fish, as is lieu noir (pollack) and they are not under environmental threat”. After the course of local cheeses, my wife had an apricot desert served with a fromage blanc sorbet and, being a chocoholic, I couldn’t resist le parfait chocolate tiede, biscuits aux noisettes. As in many fine restaurants, the desserts are ordered at the beginning of the meal and much time and care, therefore, is taken over their preparation and presentation.The meal was topped and tailed with some mouth watering appetisers and delightful mignardises (home-made chocolates and sweets), and washed down with a half bottle of Macon Villages 2007 and a 2003 Bordeaux Superieur. The bill, tax and service included, came to €121. Fine dining and well worth the price! According to the Michelin Guide there are a number of good restaurants in Montreuil. Curiously, though we’ve tried several, we’ve never had a really satisfactory meal in the town. We were once treated by friends to a meal in one of the more highly rated Michelin listed places. We’ve never gone there again. The place was scruffy and uncomfortable, the service was sloppy, and the food was dull. We’ve heard good things about the Chateau, and of Jeroboam’s at the Hermitage hotel, but on this occasion we wanted to try out the vegetarian menu at Les Hauts de Montreuil, a hotel and restaurant, not Michelin listed, in what is claimed to be the oldest building in the old town. The hotel is a member of Logis de France, a label that we’ve often found to be a reliable guide where there’s an absence of Michelin, Gault Millau or other recommendations. 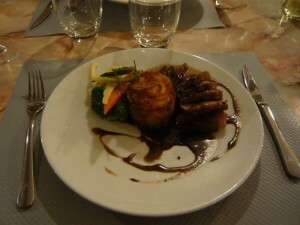 Hotels in the Logis de France guide are required to meet high standards, including having a decent restaurant. First impressions were good. 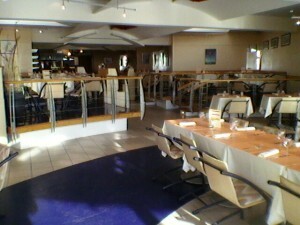 We were greeted at a reception desk and shown to our table on the upper of the two floors in the split-level restaurant. The tables are large and there’s plenty of room between them so you feel comfortably private. The room is in the oldest part of the building with old beams and exposed brickwork. There are also some impressively large oil paintings which lend an air of expensive luxury – if art were valued by the square metre these would be priceless. Without delay aperitifs were served accompanied by some truly delicious olives and a few dainty bite-size savoury pastries. By now, with a Kir and a Coupe de Champagne in hand, there was a palpable feel-good factor in the air. There was nothing wrong with either of our starters. My “Flamiche Montreuilloise”, a cheesy tart with leeks and smoked duck’s breast, a speciality of the house was a tad oily, but the sharp dressing on the accompanying salad counterbalanced it well. The vegetarian choice of “Mousse de Betterave au Crusty de Patate Douce, Sorbet Betterave” certainly looked good, but my wife, a great fan of beetroot, hinted that it was just a little short on flavour. As I hate the taste of beetroot I would have praised the chef for subtlety and given him an extra mark. Our main courses and the desserts that followed were less good. My generous “Roulade de Mignon de Porc”, stuffed with prunes and lardons, was nicely cooked but not particularly well presented and its ‘speculoos’ flavoured sauce was overpowering and too sweet for me. My cabbage, too, was laced over-lavishly with strongly flavoured lardons, and looked as if it had been prepared too far in advance and re-heated once too often. Sue thought her “Aioli du Maraicher à la Provencale” was far too oily and strong. These disappointments were not made up for by the desserts. My ‘Soupe de Fraises’, apparently a speciality, was too sweet and its decorative dobs of chantilly came, rather obviously, from an aerosol can. Sue’s ‘Pudding Maison sauce chocolat’ looked unappetising even to me, and she could manage very little of the stodgy lump. So, unlucky again, we left Montreuil a little disappointed. Although we dined in comfort and style and received excellent service, we felt let down by the chef’s unbalanced flavours. The bill was about 90 euros including aperitifs. We won’t be rushing back there, but would probably give it another try on another day. Go there for comfort, ambiance, and generous helpings rather than a gourmet experience. I have been meaning to try ‘Le Baladin’ for quite some time, so on Saturday evening I took the plunge and went there for dinner. 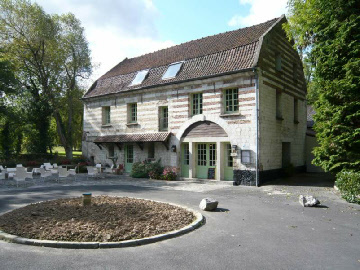 ‘Le Baladin’, is situated in Torcy, a small village in the Crequoise valley, near Crequy, and describes itself as an ‘Estaminet and Restaurant’ – in other words a Pub-Restaurant. 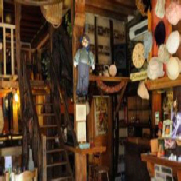 It certainly has a Pub atmosphere, with an extensive bar dominating the scene, and an eclectic array of artefacts and decorations on the walls and also on the ceiling, including an upside down table fully laid for a meal! However, what it has in ambiance, it certainly lacks in other respects, as this review will, unfortunately, show! First of all, there is no heating in the place, except a large fireplace. It was quite cold and several diners had to remind the sole barman and waiter to put more logs on the fire several times during the course of the evening. I had to ask the waiter for butter at least three times before it came in the form of one small packet of President butter. Needless to say, I had to ask for another one – again, several times! The waiter only had to look after five tables and was not exactly rushed off his feet. The wine list contained a rather non-descript assortment of wines, all at rather expensive prices. So, I settled for a pichet of red wine (10 €), also non-descript and about whose provenance I did not enquire; and, I would hasten to add, the pichet was supposed to be 50 cls, but was certainly not filled up to the top – only three quarters full! Apart from the ‘A La Carte’ menu – again, the starters, mains and desserts were quite expensive – there was a 25€ set menu, comprising three courses. However, this was limited to a few items only. I took half-a-dozen escargots to start with, followed by paupiette de veau, which turned out to be a kind of a rather small veal sausage – not the kind of hearty fare for which Estaminets are supposed to be famous! It came with a green salad and two reasonably-sized potato cakes, which, I have to say, were freshly made and quite delicious. They reminded me of Swiss rosti, which I particularly like. The desserts were also limited. A choice between ice cream and apple tart, which I settled for. I asked for a boule of vanilla ice cream to accompany it. Again, the tart was warm and quite good, but a rather small portion, and the boule was quite small too. The evening was accompanied by an electric guitarist, who, when he played and was not chatting to and having a glass of wine with a couple of the diners whom he obviously knew, played very well indeed and added to the atmosphere. I asked for the bill, and, found to my horror, that I had been charged 1€ for the ice cream. I thought that this was rather grasping and the further thought did cross my mine that it was to pay for the extra packet of butter I had requested earlier! To quote Michel Roux, the Michelin-starred celebrity chef: did I have a ‘magical moment experience’ at ‘Le Baladin’? In other words, was the dinner a memorable one? In fact, it was quite memorable, but for all the wrong reasons! And an experience, I am afraid to say, not to be repeated! Perhaps, my expectations were too high! Restaurant diners will be able to take a look behind the scenes, visit kitchens and taste seasonal produce. Food growers, winemakers and cooking schools will also participate in the event. It was going to be a birthday celebration and we had chosen a quiet little restaurant in the country where the cuisine is reliable and the atmosphere is intimate. I left it rather late to make the booking, confident that there would be no problem, so that when I finally picked up the phone, only to find the restaurant closed on Wednesdays, I knew I would be in the doghouse if I didn’t come up with an equally attractive alternative at very short notice. Sang froid is what is needed in a situation like this. 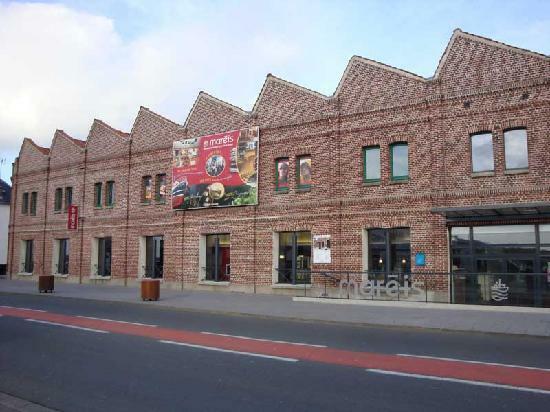 Recovering quickly, I made a booking instead at La Verrière in Berck, which I know is open every day during the July and August summer season. 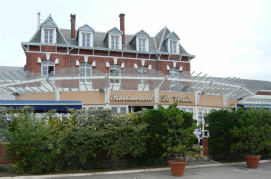 La Verrière is the restaurant attached to the casino in Berck. It’s a place that impresses with the quality of its furniture and fittings even before you are shown to your table by the impeccably mannered Maitre d’Hotel, Jean-Michel Caron. As this was a special celebration we chose à la carte. First they brought us a delightful amuse bouche, a crisp samosa filled with a veal stuffing. Next, I had the Carpaccio de Canard, thin strips of duck breast, salad with a hint of mint in the dressing and a crisp parmesan biscuit. The birthday girl chose a starter of roast tuna. She continued with a spectacular lobster dish, Méli mélo de homard, sabayon de concombres et poivres torrifiés, sur une fondue de légumes de saison, while I enjoyed a beautifully presented Poelée de rougets aux sucs de volaile et d’asperges vertes, farce fine de champignons, petite salade d’herbes aux pignons de pin caramelisées. We chose a Sauvignon Blanc which added only 17 euros to the bill. It came in a 50cl bottle, ideal for two. Cheeses come from the celebrated fromagerie, Caseus, at Montreuil. Now, this was a celebratory dinner, so yes, it was relatively expensive at €137.50 for two, including aperitifs, but we both agreed La Verrière was worth every penny. However, you don’t have to spend a lot to eat at la Verrière. We noticed as we browsed through the carte and the menus that they offer a couple of excellent value menus at fixed price, plus their “Suggestion du Jour” formula at only €13.50. For this you get an amuse bouche as a starter, a choice of main course from the €29 “Saveur de Temps” menu, and a generous glass of wine. This formula is available at lunch or dinner, any day of the week. We decided there and then to go back on Saturday night and try it. It’s not often you’ll see a review of a restaurant in which the reviewer tests two completely different types of meal, at widely different prices, in the same establishment in the same week. It’s a great pleasure to report that for only €31 we enjoyed another excellent meal. This time we both had Filet de Lotte rôti au thym sur une fondue de poivrons doux et poireaux, étuvée de céleri et jus crémeux de bouchots. A generous piece of monkfish, perfectly cooked, arrived on a bed of leeks, peppers and celery, all surrounded by mussels. A glass of a very good house white accompanied the meal and the only extra we ordered was a small bottle of mineral water. 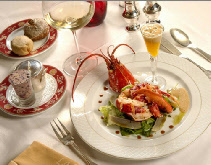 Whether it’s for a full scale celebratory dinner, or a quick lunch La Verrière will not disappoint. The service, under M. Caron’s calm supervision, is efficient and formal without the unnecessarily elaborate flourishes you sometimes find in other Michelin listed establishments. 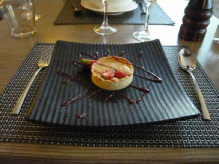 A comfortable restaurant with a warm and friendly atmosphere, excellent service and fine cooking – places as good and as accessible as this are not easy to find, even in France.